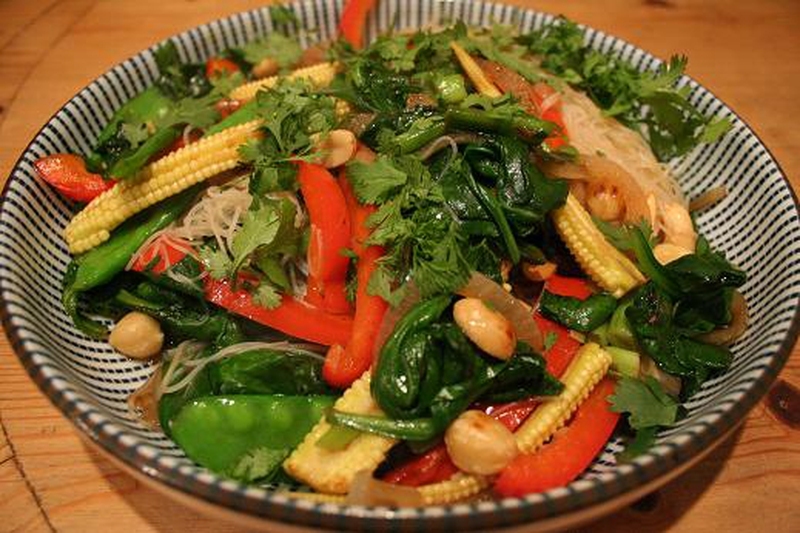 A very quick, easy and popular meal for vegetarians is the vegetarian stir fry. It is healthy and there are various types can be prepared. You can have the traditional or the creative one by adding tofu, seitan stir fry, Chinese stir fry, Thai-style stir fry and much more. It is a very flavorful and healthy stir fry recipe. You can add the vegetables and tofu to increase the protein content of the dish. Marinate the tofu pieces in 3 tbsp. of hoisin sauce and brown sugar and then refrigerate. Toss the tofu in white flour and fry in hot oil for 1 minute or till it becomes medium brown and then drain it. Combine remaining ingredients of stir fry sauce in a bowl. Heat oil in a wok, fry onion and garlic for 1 minute. Add carrot, celery and 2 tbsp. of sauce, fry for another 2 minutes. Add the broccoli and mushrooms, stir fry while adding some more sauce. Add the bok-choy, red pepper and remaining sauce. Stir fry for 2-3 minutes and ensure vegetables are crisp. Top with warm tofu and serve with rice. A very easy recipe can be made from instant rice or left over rice. Cook the instant rice in the boiling vegetable broth and then simmer till the broth is completely absorbed. Stand rice on a large plate for 5 minutes. Heat a wok and coat with cooking spray. Pour beaten eggs and cook while stirring gently. Remove in a small bowl. Heat canola oil in pan, add asparagus and cook for 2 minutes. Add bell peppers, scallions, ginger and garlic, cook till vegetables turn tender. Add cooked rice, soy sauce and vinegar and cook for 1 minute. Mix the eggs and remove from heat. Drizzle sesame oil and hot sauce. It is a colorful recipe with and nutritious, which can be done easily. Mix soy sauce, rice vinegar and chili garlic sauce in a bowl. Heat oil in a wok, add ginger and cook for 30 seconds. Add the snow peas, radishes and scallions and cook till the peas are tender yet crisp. Add the sauce and stir till it coats the vegetables. Remove from heat and mix the toasted cashew nuts. With Tofu and noodles, this is a yummy meal for a summer night. Cook noodles in a large pot, drain and rinse with cold water. Keep them aside. Heat oil in a wok, add tea leaves, ginger and garlic and cook for around 30 seconds. Add tofu and cook for 2 minutes. Stir in the bell peppers and cook for further 2 minutes. Toss to combine noodles, scallions, soy sauce and vinegar. Cook for 2 minutes till the noodles are heated through. Drizzle the sesame oil, freshly ground pepper powder and toss. This dish has lot of flavor and texture and is packed with nutrition. Heat a large wok and coat with cooking spray. Pour beaten eggs and cook till set. And then cut the eggs into thin strips and keep aside. Make a thick paste with almonds, chilies, garlic and shallots. Heat oil in a pan, cook the paste for 2 minutes and keep aside. Add remaining oil in pan and add shredded vegetables. Cook till they are crisp yet tender, stirring occasionally. Add the shallot paste, soy sauce and rice. Stir till it is combined well. Transfer to a dish and top with strips of scallions and egg. Garnish with tomato and cucumber slices. Server responsed at: 04/22/2019 4:45 a.m.